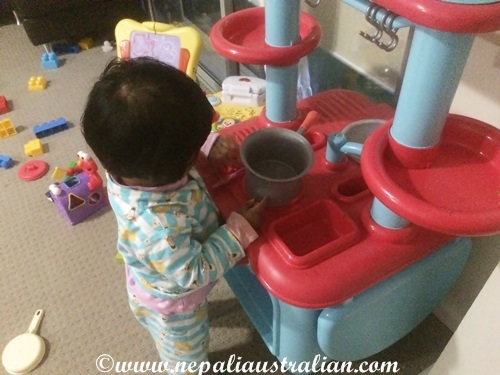 Recently I talked about how we are trying to wean Chhori off her night feed. Well it’s been more than 3 weeks and it is working well. I have to say a big thanks to dear hubby as I have been sleeping well (7-8 hours a day) for the last 3 weeks. There is also progress with Chhori as her night awaking has lessened and we hope in a few more weeks she will sleep through the night easily. But last night, I felt a hurt (being a typical mum I guess). Our normal night time routine is, after dinner, I breastfeed Chhori for a while then, AS takes Chhori to the room to sleep. I think, these days she has started understanding that mummy is not coming to the room to sleep with her. So I was breastfeeding last night when AS went inside the room and put on the rhyme he plays to put Chhori to sleep. As soon as she heard it, she paused her feeding and tried to find out where rhyme was coming from. When she realised that it was coming from the room, she stop feeding, got off my lap, off the sofa and went inside. She didn’t even turn back. Normally I kiss her good night but because I was not expecting swift her action, I felt a pinch in my heart. Don’t get me wrong. I am extremely happy that she is at this stage now. It is just that I need to get used to all these changes in her as well. In a few months’ time, I am planning to stop breast feeding altogether so I am sure there will be many more moments like this. She is growing bigger every day and she is becoming smarter as well. These days, we have tea party. But she is adamant that we only use specific cups. The pink one is hers while the purple is mine and green is for grandma. We do pretend to drink and eat. 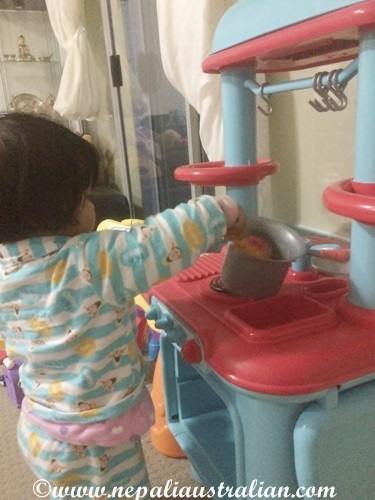 We got her a toy kitchen so she cooks and cleans as well. I love how she uses the toy tap and pretends to clean her hands and dishes. Also she enjoys blocks and things with caps on. She also likes shape sorter toys and I am glad it keeps her busy. I hope she will speak a more words soon and I can talk to her 🙂 . I am loving every moment being a mum and it is definitely one of the best feelings in the world. Do share what you do with your time with your kids. 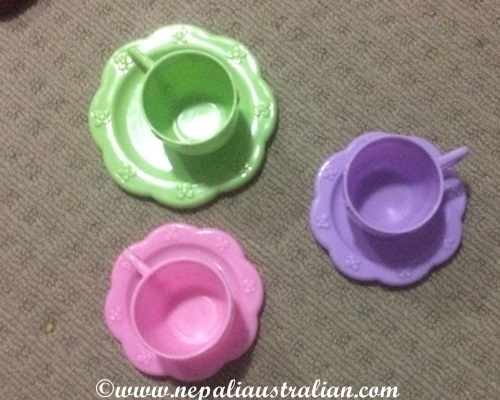 What are some good toys and games for a toddler for their development and to keep them engaged? 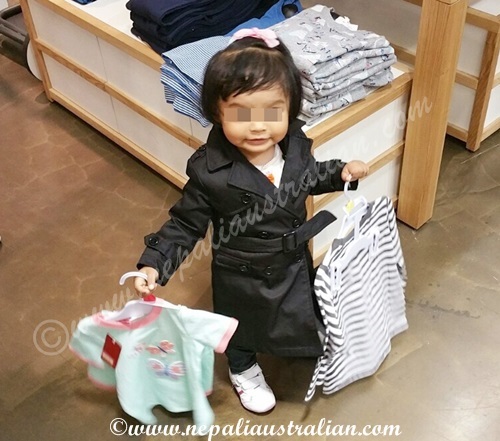 This entry was posted in Being Mum, Our daughter and tagged Australia, australian, australian nepali, baby, breastfeeding, chhori, cute baby, kids growing, M from nepaliaustralian, mum, Nepal, Nepalese, Nepali, night weaning, sleep, tea party, weaning. Bookmark the permalink.